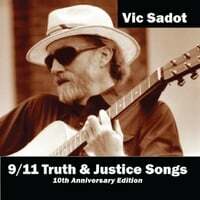 “Truth Troubadour” is the title of Vic Sadot’s latest CD with 18 songs. Truth Troubadour is the most acoustic and reflective CD of the 4 CD’s that he has posted since first teaming with DiscMakers and CD Baby in 1997. Seventeen of the 18 songs on Truth Troubadour are duos with Vic on guitar and vocals, and some piano accordion on several songs. Eric Golub contributes his formidable talents on various stringed instruments: viola, violin, and 2 ukuleles. It’s a mix of broadside ballads and sweet love songs. Truth Troubadour was published to CD Baby on Dec 2, 2016 and to CD Baby’s new Artists Audio Collections at YouTube on Dec 11, 2016.